Nursing Homes, Assisted Living, and Home Care: What’s the Difference? Today’s guest post comes from Sue Logan, R.N. If you are looking at care options for yourself or a loved one, it can seem like the more you look, the more confused you get. It used to be that the nursing home was the only choice. But now, the number of options available for senior care services is overwhelming. What’s the difference between a skilled nursing facility, assisted living, and home care? How do you make a decision? What do services cost? Before you look any further, let’s stop for a minute and get some direction. Below, you will find basic information about the top three kinds of care available for the elderly: Nursing homes, assisted living facilities, and home care. This information will help you make sense of services for seniors. Physicians often recommend skilled nursing facilities (SNFs) or rehab care following surgery or a stay in the hospital for a medical condition. The various therapies, such as occupational, speech, or physical therapy help patients regain the strength or skills they need to be able to return home. If a person does not require “skilled” care, but is frail and has complex needs, an intermediate care facility (ICF) may be necessary. The care provided in an ICF includes assistance with getting into and out of bed, bathing, grooming, dressing, and eating. Laundry service is also provided. 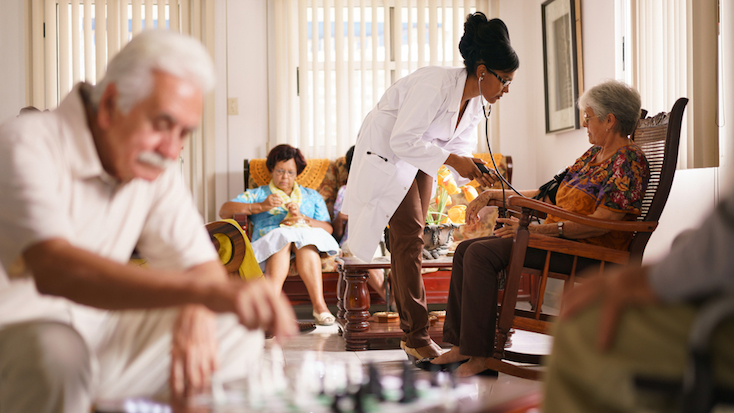 Unlike assisted living facilities, nursing homes provide a high level of medical services and care. Licensed doctors supervise the care of every patient in a nursing home, whether a skilled or intermediate care facility. Medications are carefully administered by professional staff and are reviewed by physicians and pharmacists. While the goal of nursing home care is to meet all of the patient’s physical and emotional needs, the financial burden can be tremendous, ranging from $5000 to $9000 or more per month. This cost includes meals but often does not include the cost of medications. Medicare or private health insurance may pay for skilled nursing facility care, but only for 100 days of care per year — patients must cover the costs out-of-pocket for anything beyond that during the same year. Likewise, Medicare does not pay for help with bathing, eating, or dressing, if that is the only assistance needed. You may qualify for Medicaid if your assets and income are limited, but many nursing facilities do not accept this form of payment. Some people are fortunate enough to have long-term care insurance that sometimes helps cover the cost of a nursing home stay. Veteran’s benefits are another possible source of funding to help defray the expense. Unfortunately, out-of-pocket (private pay) is how many families are forced to pay for their loved one’s nursing home care. An assisted living facility (ALF) consists of seniors who no longer wish to stay at home, or are no longer able to safely live independently, but do not require the extensive level of assistance provided in a skilled or intermediate care facility. For seniors and their families, an assisted living facility can provide companionship and structure and may ease the transition out of the no-longer safe or practical family home. 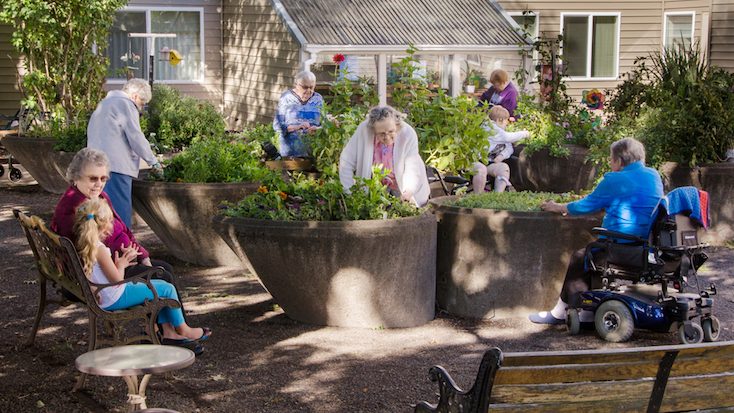 Most residents enjoy a high level of autonomy combined with privacy — something not possible in a nursing home — with the benefit of supervision or assistance as needed. Services routinely provided in an ALF include three meals daily in a central dining location, assistance with medications, housekeeping, laundry, and personal care such as dressing, bathing, and grooming. Transportation services and social activities are also offered in most assisted living facilities. Residents of assisted living facilities most often reside in private, small apartments, sometimes equipped with a limited kitchenette. Staff members are available throughout the day and night for safety. Most ALFs provide nursing services, but this may not include 24-hour per day professional nursing coverage. The vast majority of residents in assisted living facilities pay privately, or out of their own personal resources for their care. Most ALFs do not accept Medicaid and, since the care provided is not skilled, Medicare does not cover the cost. The cost of staying in an assisted living facility ranges from $3000 to $4500 per month. If you are looking for assisted living for yourself or a family member, one important concept to become familiar with is “levels of care.” This is essential because, in many ALFs, the monthly cost is based on how much care the resident requires. Levels of care are a way for facilities to stratify costs — as levels of care increase, so do monthly costs. Most ALFs that use levels of care in this way assign three to four levels. This not only simplifies their billing, but it makes the process easier for the consumer too: You know what you will pay up front, and the monthly charge is fairly consistent. A resident who is independent with all activities of daily living (ADLs) would be assessed no cost-of-care fee in addition to the monthly fee. From there, most facilities calculate points, based on whether simple verbal reminders, stand-by assistance, or complete physical assistance is needed with tasks like taking medications, dressing, toileting, grooming, mobility and bathing. Extra points are also sometimes assigned if a resident is incontinent, confused, or requires a wheelchair or other assistive devices. Facilities also take into account how many staff members would be needed to assist the resident. For example, if a resident requires help from more than one caregiver to transfer in and out of bed safely, additional points are assigned. The level of care is then determined, based on the total number of these points. The more points, the higher the level of care, the steeper the monthly cost. A representative from an assisted living facility will typically visit with you or your family before admission if you are considering a move to their community. An assessment will be completed, and you will be given the opportunity to ask questions about the costs and the care they can provide. Home care covers a wide range of personalized services that are provided in your home. It is just as effective, but more convenient and much less expensive than the care you receive in an assisted living facility. Many seniors don’t require specialized medical attention, but could use additional help to maintain their independence. In these situations, non-medical home care is the perfect answer. Unlike assisted living, care is provided in the client’s home, according to their needs and schedule. Caregivers also provide one-on-one loving companionship and emotional support to their clients. This can sometimes be hard to find in large group facilities. 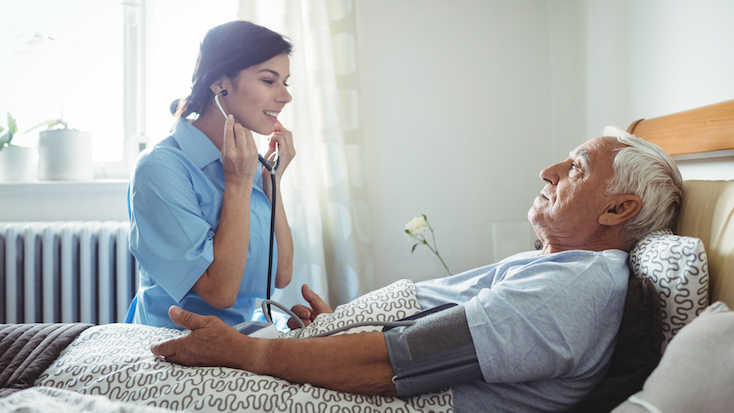 Should the senior require the kind of medical attention you’d normally find in a nursing home or assisted living facility, then you may consider home healthcare, sometimes shortened to just “home health”. As you might expect, this level of care will require the experience of (or equivalent to) a registered nurse, and will likely cost much, much more than non-medical home care. The cost of home care is determined by how frequently the services are needed, but policies vary depending on which agency you choose: some may require an upfront deposit equal to so many hours or days worth of care, while others impose shift minimums (i.e., you can’t schedule less than X hours at a time). Non-medical home care costs are generally not covered by Medicare because the services are non-medical in nature. However, there are tax breaks available to individuals who help coordinate home care services for themselves and loved ones. Likewise, eligible veterans and their spouses can take advantage of the VA’s Aid & Attendance program, which provides an increased monthly pension to help cover the costs of home care. Families eligible for Medi-Cal are typically eligible for In-Home Supportive Services (IHSS), a program that helps offset the cost of non-medical home care. Hire a caregiver directly — Many families place ads on local community message boards (like Craigslist or NextDoor) or visit referral sites looking for caregivers. While this may be the cheapest option, hiring a caregiver directly means you may be liable for certain legal obligations as that caregiver’s employer, such as employment taxes, health insurance, workman’s comp, background checks, and more (depending on your relationship with the caregiver). Also, you will have no support in the event the caregiver cancels or performs their job poorly. Hire a caregiver through an agency — If the idea of taking on employer responsibilities sounds like too much work, you may want to consider hiring a caregiver through a licensed home care agency. The costs will likely be higher than hiring a caregiver directly, but you will have peace of mind knowing the caregiver has been thoroughly screened and is backed by a support team that can help coordinate additional care and services. Interested in scheduling non-medical home care for a loved one? HomeHero is a fully-licensed home care agency that combines human compassion and smart technology to help people live independently at home. Click here to learn more and receive a free consultation from one of our Care Advisors today!